The birth passage is made up of three parts, the pelvic inlet, pelvic cavity, and the pelvic outlet. 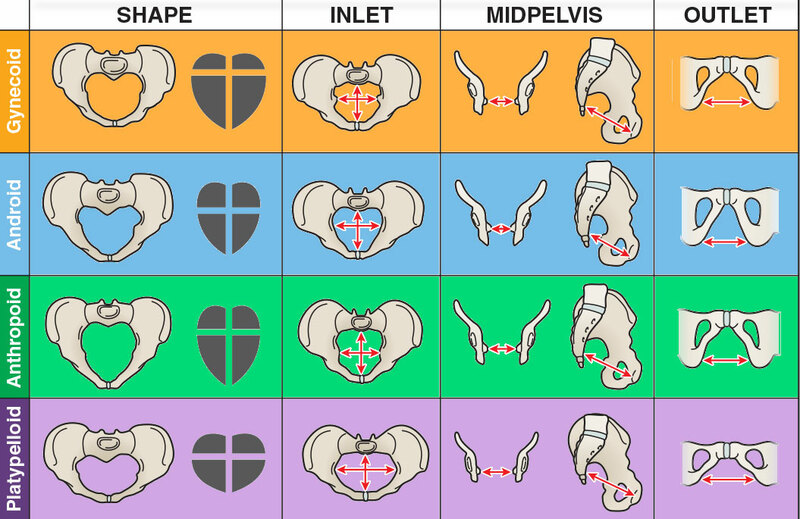 Among them, the gynecoid type of pelvis is the most commonly found and has the diameters that are structurally ideal for vaginal delivery and child birth. In the gynecoid pelvis, the anterior/posterior and lateral measurements in the inlet, midpelvis, and outlet of the true pelvis are largest. The inlet is laterally round to oval-shaped; it is a feature that enhances its capability for childbirth. The ischial spines are less protuberant compared to other types. A deep, wide curve is found in the shortened sacrum. The subpubic arch is wide as well as round. All these features improve the capability for a vaginal birth. At the time of labor it enables early and complete fetal internal rotation. The other pelvic structures may create problems for vaginal birth. In all three planes of the pelvis this shape has the best diameters. The gynecoid pelvis is found in approximately 50% of all women and considered a true female pelvis; it is rare in men. Due to the round inlet and spacious pelvic outlet, vaginal birth is easier in this type of pelvis.